“It was two years ago,” said Lauryn Trede sitting next to her aunt Sandy Fasso in the garden outside Craig Hospital. The two looked up at the Liniger Bridge to Independence, which connects Craig’s east and west buildings. 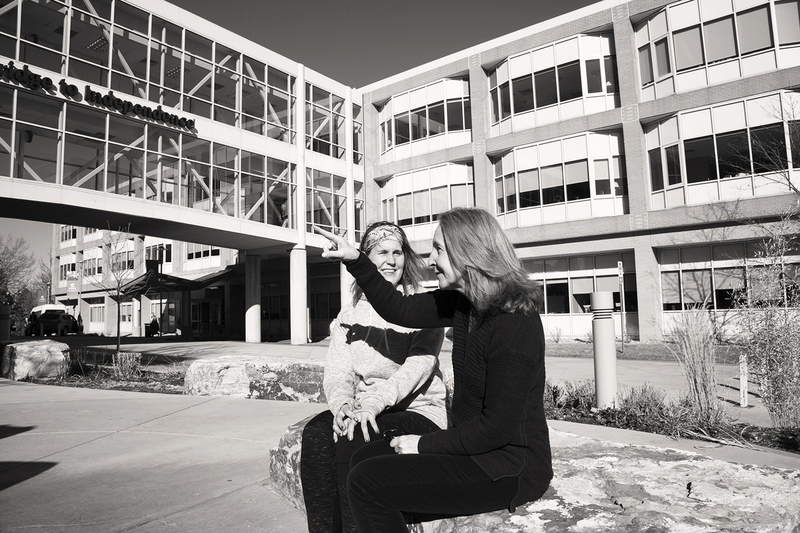 It’s often a popular spot for patients and families to stop and get some sun in between therapy sessions. “We’d sit on that bridge and look out at Pikes Peak,” Sandy said. In December 2014, Lauryn Trede, a Chicago-native turned Denver transplant, was crossing the street three blocks from her home when she was struck by a car and sustained a traumatic brain injury. Lauryn first remembered waking up in the hospital. “I had a bunch of tubes down my throat so I couldn’t talk. I just remember hating the tubes in my throat,” she said. When Lauryn came to Craig for rehabilitation, her father and aunt were by her side every day. Her mother passed away when she was eleven and her aunt Sandy, her mother’s younger sister, stepped in and assumed the role as caregiver for her niece. “That’s what I would look forward to every morning was knowing she was going to walk through the door. A familiar face,” said Lauryn recalling her days at Craig. After rehab, Lauryn moved in with her aunt and uncle. She wanted to continue her Colorado dream. “There was nothing to talk about. We knew Lauren was always going to have a home with us,” said Sandy. Sandy would take Lauryn for walks and push her wheelchair. When Lauryn progressed to a walker, Sandy would carry a folding chair for Lauryn to sit on when she needed to rest every 20 feet. Sandy helped Lauryn shower, get ready, and drove her to therapy. The two became very close. It has now been two years since the accident. Lauryn still lives with her aunt and uncle. She is able to walk, drive, and is back at work. She also helps care for her grandmother who recently moved into the house. 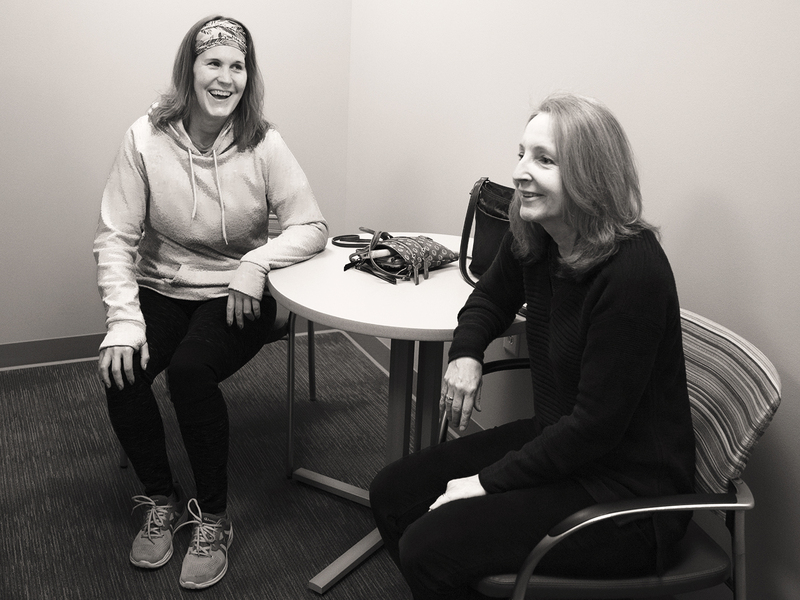 The transitions Lauryn and Sandy made from inpatient to outpatient, to almost nearly independent, were not always easy, but were met with grace and humility. “I don’t think I would have had as much pivotal success with my recovery if it wasn’t for her, her being so encouraging and supportive,” said Lauryn. 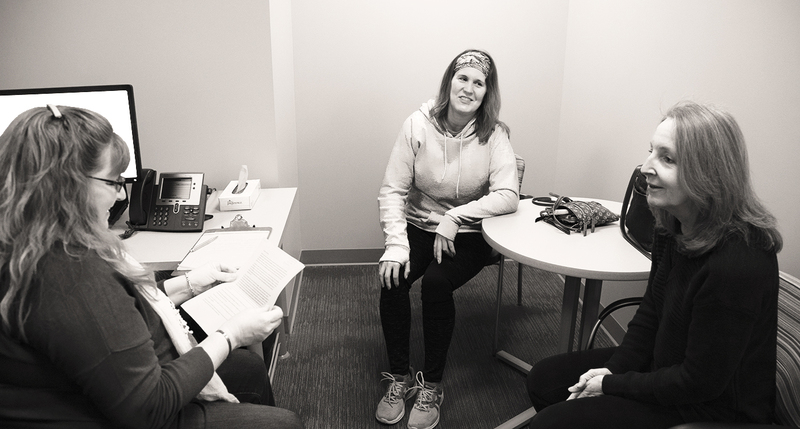 We asked for them to share some tips with patients with brain injury and their caregivers. Take time for yourself. Sandy took an hour each day to maintain her practice of meditation. She said it helped her feel grounded and gave her more space to be there for Lauryn. These days, she makes sure to have one date night a week with her husband. Go to rehab therapy sessions. “That’s a word of advice I would give to a family member who is going to be a caretaker. If they can, spend as much time, go to the therapy sessions, observe, learn,” said Sandy. Take notes. During Lauryn’s therapy sessions, and throughout rehab, Sandy took diligent notes. She said they were instrumental in their transition home because she could look back on what therapists said or instructions she had been given. Allow others to help. Sandy spent all day, every day in rehab with Lauren. Her husband Jerry picked up the housework and made her dinner each night. She said this allowed her to relax and focus on Lauryn. Live in the here and now. “Just take it minute by minute, hour by hour, day by day. And know it will get easier. It will get easier oryou’ll learn to adapt,” said Sandy. Recognize milestones. “Recognize your accomplishments, recognize those milestones, some of them seem really little, but they all add up eventually – so keep in mind what you can do today, what you couldn’t do yesterday or last week,” said Sandy. Sandy and Lauryn marked the one year anniversary since Lauryn walked without a cane with a long walk outside together. Get involved. Lauryn participates in hippotherapy (using horseback for rehabilitation) and joined Craig’s Brain Injury Community Recreation Group (BICRG) which involves outings with other people living with brain injuries. “Similar experiences, similar struggles, it’s huge to have someone who can relate to you,” said Lauryn. Use humor. Lauryn tries to find the humor in situations that might make people uncomfortable, like when asking for help or explaining something. Go to counseling. After rehab Lauryn saw a counselor. She said, “Just speaking with a non biased party about struggles, what I’ve overcome, what I’ve accomplished and what I want to accomplish was huge too. Find the positive. “An experience like that really teaches you how to appreciate life. The people and circumstances in life. Just to be able to jump in my car to go to Target to buy deodorant is huge,” said Lauryn.